A patron requested books about blended families some time ago and I totally blanked. I did some searches, but found mostly adoption and/or divorce stories, nothing about remarriage and new siblings. Storytime Underground came to my rescue and I'm listing titles here for future use! I've added divorce titles as well, although there are many more than the ones I've listed here. I don't necessarily recommend all of these - many I haven't looked at - they're just a reference list. This is a shortened week because we're closed on Monday. I'm really trying not to be stressed this year. I've made a simpler summer reading program, I'm "only" doing 3 programs a week, and I've gotten two volunteers lined up to take care of summer reading on Thursday and Friday mornings so I don't have to work 10-12 hour days or simultaneously run srp and a program. Some days I feel confident and energized and Ready For Summer. Some days I can't breathe for the anxiety. Baby steps...I've been telling kids for the past 7 years that the only "rule" for summer reading is to HAVE FUN. So why am I not having fun? This is the first year I've let people sign up early for summer reading. I'm hoping this gets a better turnout, means we don't lose those folks who go on vacation as soon as school ends, and cuts down on the crazy first day of summer reading registration. I also used class lists to sign up the 180 kids who visited the library this week. We signed up about 20 kids on Tuesday, so that was a good start! This week is also when my school visits start in earnest. All the titles I booktalk (my school visits are basically orgies of booktalking) can be found here on the library's Pinterest page. Apart from the school visits, this week's big project was cleaning out the storyroom storage closet. I worked on it basically all week! I still need some more shelves - will wait to see what the circulation staff don't want after their workroom is reorganized in the near future. I also took out two old wooden shelves and repurposed them for the juvenile video games. The weather kind of made the school visits weird. I rarely have kids come to see me, but I had two big groups who wanted to. We had to reschedule the third graders twice and the second graders ended up coming for two hours because their tour of town got rained out. I added summer reading and the first grade scavenger hunt to stretch things out. The third graders finally made it on Thursday. This was a group effort - one of our staff covered the information desk and Jess supervised butterfly mask decorating and scavenger hunts. Meanwhile, I booktalked, promoted summer reading, and held my own against the flood of kids desperate to touch the shiny books. We figured out we need a scavenger hunt for 3rd graders - I had a mix of the 1st grade and my 5th/6th ones, and neither was quite what we needed. Anyways, even if I am overly perfectionist, the kids and teachers had a great time and are already planning to come back next year. Even if not all the sixth graders listen (or come back and do summer reading) I am still reaching people - even if it's just the teachers! Some were very excited to find out about class cards, so they don't rack up fines during the school year. Haven't seen these two in a while, but they wanted WWII books that they hadn't read and mysteries/Harry Potter read-alikes for a long trip. Fortunately, since they hadn't been in in a while, I had some new WWII books - the young reader's edition of Atkinson's D-Day, Pure Grit, and The Boys Who Challenged Hitler. We looked at a lot of other things for mysteries/Harry Potter read-alikes and she ended up with about 10 books. One of my sixth graders came back with his mom after I visited today - a high lexile reader and we spent a lot of time figuring out what he could/should read and whether or not his lexile was going to get so high there was nothing he COULD read. I showed him some teen books he might like and then he hung out with another middle schooler, who helps me out after school a lot, while his mom and I talked. As I expected, Roller Girl and the new colorized Babysitter's Club are going to be HUGE. I should have bought more than one copy. Lots of 3rd graders knew Ellie McDoodle - both boys and girls! and are absolutely thrilled that the author is coming to visit! The glory that is my reorganized storyroom. I used to have a shelf against the wall and a bunch of stuff crammed back here. Alas, no more. The tape of NO has been administered. The bags hold bells, shakers, a parachute, and bubble wands. the tubs on the very top have all our fabric paint and markers, because they're used rarely, then a lot of misc. stuff, beads, then markers and crayons and other stuff. These are the two shelves that were in the storage room - one where the yellow tape is, one in the cleared space. I put them under the bulletin board and moved our games onto them so now the kids can reach the games and we have a new display space. I'm usually a little leary of these slice of life beginning chapter books, but this one was oddly comforting and very sweet. I have a lot of parents right now looking for read-alouds for preschool-aged children and this fills that need very well. 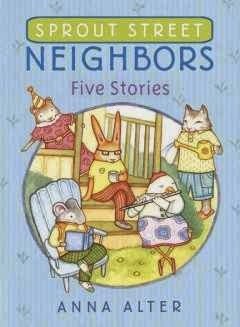 Five short chapters introduce five friends and their daily lives on Sprout Street. In the first chapter, The Acorn Problem, Henry the mouse tries to think of a tactful way to tell his upstairs neighbor, Emma the squirrel, that her thunking acorns are disturbing his Saturday morning nap. The next chapter, The Best Birthday, features Emma and her efforts to have the best birthday party ever. Fernando's Wish features Fernando's longing to do something in the annual parade and his fears of performing in public. With the help of his neighbors, especially Violet who plays the flute, he fulfills his longing to dance. Violet is featured in the next chapter, The Surprise, as she learns that sometimes you do need help from your neighbors. She finally accepts help from her neighbor Wilbur. 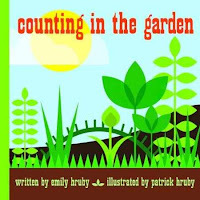 The last chapter is about Wilbur and The Secret Garden, when all the neighbors come together to save Wilbur's beloved garden in an abandoned lot. Alter's soft black and white illustrations are strongly reminiscent of Peter McCarty. Honestly, I had to look twice to make sure he wasn't the illustrator. Her artwork is a strong fit for the story though, simple and attractive, with each character having a clear personality and recognizable characteristics, both physical and personality-wise. I liked the little accents scattered throughout the book as well. Verdict: This won't be a hugely popular title with most beginning readers; it's much more in the vein of the classic Frog and Toad easy reader, which isn't really that popular anymore, at least at my library, but that makes it a good choice as a read-aloud to younger children or for those kids who like more peaceful, everyday stories. The text has the numbers (both numeral and text) and the color shown in the picture. A key on the back cover lists the butterflies shown. The illustrations in this little board book (only ten pages!) are very realistic, so much so that I had to look twice to see if they were photos or drawings. 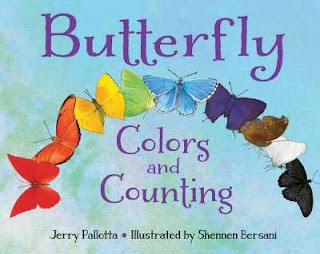 Readers can both count and identify the colors of ten brilliantly drawn butterflies. The pages are a little thinner than a normal board book. Verdict: This is a pretty but light offering. I keep taking it on and off my order list because I'm afraid the thin pages won't hold up to extensive checkouts though. Although I normally don't like yellow/orange/pink color schemes, I did love Byun's Dream Friends. I've also liked Linda Ashman's stories, especially as it looks, from her latest books, as though she is getting a really nice range of diversity in her illustrators. So I was delighted to get a review copy of this sweet and joyful picture book. A pudgy little child, complete with Shirley Temple sun dress and lacy white shorts, celebrates a lovely summer day. She builds with blocks, explores outside with her mother, helps in the garden, visits the park, and has a treat while they wait for the rain to end. After a happy, busy day, they walk home in the golden glow of the sunset and settle down for a bedtime story and bed. The toddler's day is not without incident; she has a fall and several messy incidents necessitate a new outfit. However, the overall flavor of this book is sunny, even when it's raining. A sunny smile, happy playing with a diverse group of friends in the park, lots of animal friends, lots of outdoor enjoyment and simple pleasures. I love Byun's sunny art, even though the color scheme isn't normally my favorite, it just really works with her style. Everything is golden, pink and sunny, especially the walk home in the evening where everything, shiny from the recent rain, seems to glow from the page. The friendly dogs and bright splashes of color will catch the attention of toddlers while harried parents will appreciate a reminder of some of the joys of small children, even if they're not feeling them at the moment! Verdict: This is just a really strong feel-good story. 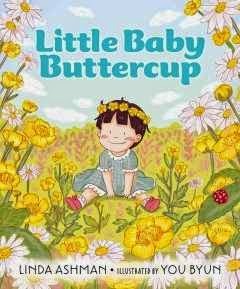 A diverse cast of children, including the protagonist, a joyful appreciation of everyday treats and trials, and a warm understanding of a toddler's joys. Highly recommended. I saw this idea for a display....somewhere. A long time ago. I've been doing it with little slips of paper, which fall out of the books all the time. I finally got it together, printed out, colored, cut out, laminated, and cut out again 15 speech bubbles (ok, actually a volunteer and staff member cut out most of them, but you know). Then I discovered that they were TOO BIG and the tails aren't long enough to stick in the books. Also, the grammarian in me realized they make more sense if they say "like" and not "liked" because I often do genres and things, not just specific books and movies. However! They look not too bad and I will use the bigger ones for the shelves with higher ceiling spaces and make some smaller ones! if it was Dairy Queen "like ice cream". Uh, no. I'm generally not one for "heartwarming true tales" about animals, but this one drew me in and I actually enjoyed reading it. The collection starts with a brief introduction talking about how important animals are in our lives and then the stories begin. "The sled dog who helped save the children of Nome" is a really thoughtful, nuanced look at the story of Balto, explaining how many different teams were involved in the dangerous journey to bring medicine to Nome. "Balanchine's Elephants" tells the story of a special ballet, created by a great choreographer, but danced by elephants! I really appreciated that the text explained the characters involved simply and clearly, without assuming prior knowledge. "Simon: Ship's Cat First Class" was a new story to me, about a cat in World War II. He died before receiving the many commendations and medals he was to be awarded, but was well-known in England during and after the war. "Keiko, the orca movie star" was the one that I felt the most doubtful about. It's about movement to free Keiko, original star of the Free Willy movements. Although it talks about Keiko's captivity not being beneficial, it's mostly in terms of how his pool was too small. He's illustrated with the drooping fin, but it's never mentioned. Although this is a historical story and the debate over keeping killer whales captive is a more contemporary issue, I felt it should have at least been mentioned. "Daughter of Sunshine" jumps forward to a more contemporary story. In 1996 a little boy fell into the gorilla enclosure at Brookfield Zoo and a gorilla picked him up, protected him from the other gorillas, and got him to a keeper. I had heard this story before, but somehow had never realized exactly where it had happened. I've been to Brookfield and those enclosures are high. "Owen and Mzee: An Unlikely Pair" rehashes the now-famous story of an orphaned baby hippo and the tortoise he bonded with. The book then jumps way, way back into history with the story of "The Capitoline Geese", sacred geese who reputedly warned the Roman soldiers of attack during a siege. Then we're back to the present day with the story of "Hoover, the Talking Seal" an orphaned seal who could reputedly make human sounds. A classic story, "Greyfriars Bobby" comes next, with a discussion of how much of the legend is true and how much is speculation. A modern story comes next, the story of conservation efforts by Lawrence Anthony, also known as "The Elephant Whisperer" and his bond with the elephants he saved. Back to another classic story, "Cher Ami, the pigeon hero" set in World War I. A more scientific approach is used in the story of "Washoe, the hand-signing chimp" which discusses the different scientific theories about the extent to which animals can communicate with humans. Then back to the heartwarming in the viral story of "Christian the lion". A community comes together in "Saving the whales" a story of a pod of whales trapped under the ice in Alaska. A series of famous animals show up in in the stories of "Seabiscuit, the people's horse", "Smokey, the firefighting bear", "Pale Male, Big-City Hawk", and "The Last of Lonesome George." The last story is an odd choice - it's a random story from 1998 about two pigs who escaped from a slaughterhouse in Britain, "The Tamworth Two." Each story includes not just the basic facts but also a discussion of the historical context, broader perspectives on the story, and additional facts and similar stories. A map of the world, showing the different stories, a timeline, and a "cast of characters" briefly reviewing all the stories with thumbnail photographs are also included. Back matter concludes with an author's note about the family connections behind the writers, resources and further reading, index, and photo credits. While the bulk of the stories are set in the west, there are tales from around the world and they include local people in most of those - discussing the locals who saved Owen and Mzee despite their own tragedies, etc. However, of the few people pictured with the animals only a few, indistinct pictures show people of color. Part of this is that the stories with more close human involvement all feature white people, but there were several illustrations that could have featured more distinctly the non-white people and crowd scenes that could have been more diverse. This is being promoted to an older audience, but I'd actually consider it a picture book collection. The book is formatted like a picture book with bold, attractive artwork. Each story is only about 6-10 pages long, with several of those being illustrations. While the stories are honest and present some controversial and sad stories, they don't emphasize the darker side of the stories and there's nothing inappropriate here. 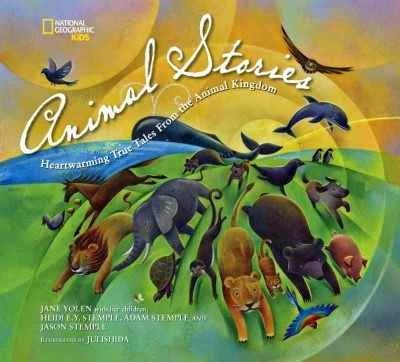 Verdict: While I don't currently need any more animal stories for older readers, this would be an excellent collection to promote to parents who enjoy reading aloud longer stories to their kids, or for smaller kids to page through and pick out their favorites. 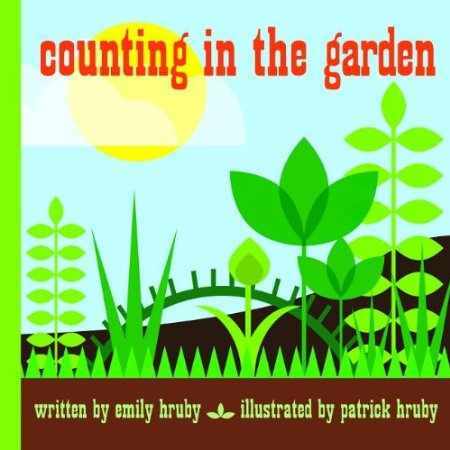 There's a nice variety of stories and they are all told well with interesting details and age-appropriate information. Recommended. for the juvenile series shelf. I keep telling myself that this year, summer will be so much simpler. No big projects, no stress. HA. Apparently I can panic and stress with no reason. I am very talented. Garden day was supposed to be when the homeschoolers got summer info and for people to come help out with planting the gardens. Well, it was freezing cold, I didn't have the dirt or plants, and only about 3 families showed up. We did get a lot of weeding done, with me and two other staff members, and talked about the future of the gardens and outdoor programming. "clean" reads for a middle grade student. I helped them find some of the titles they had on a list and then recommended Patricia Wrede's Enchanted Forest Chronicles and Lois Lenski's historical novels. Books for a child going into 2nd grade - recommended Branches and several other beginning chapter series. Books for a preschooler with high language abilities, but who gets bored with readers and just wants to be read to. 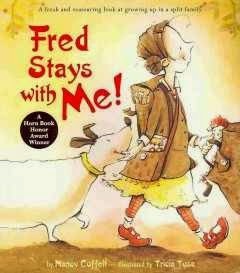 We went through a lot of possibilities, including the We Both Read series, Toon Books, and some other graphic novels. Pixie sticks? I think? It's not a series we have. I went through pretty much every beginning fairy chapter book until she agreed to take Emily Rodda's Enter the Fairy Realm omnibus. then used the audiobook space to move over the magazines. where we will be doing stealth programs/activities. I was incandescent when I got a galley of Ursula Vernon's newest series, Hamster Princess, and it fully lived up to all my hopes, of course. Ursula Vernon never disappoints. "Once upon a time, in a distant land, there was a beautiful princess named Harriet Hamsterbone, who, as her name indicated, was a hamster." Thus begins the most riotous, hilarious, flip-all-your-preconceptions-on-their-head retellings of Sleeping Beauty I have ever read. 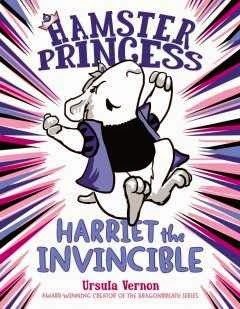 When Harriet finds out about the curse the evil Ratshade has placed on her, that on her twelfth birthday she's doomed to fall into a long sleep until a prince kisses her, she realizes that means....she's invincible until her birthday arrives! She promptly sets out to do something with all that invincibility and even manages to break the curse! But there are unexpected aftereffects and now she really, really does need a prince. But will any prince be willing to help out Crazy Harriet Hamsterbone? Like the long-running Dragonbreath series, this new series starter combines graphics with text. The illustrations are in dark blue and purples. they include some pages of panels and a plethora of spot illustrations, mostly of Harriet. This series is just so much FUN. Kids and adults alike will giggle their way through and maybe even pause and think a little bit about preconceived ideas, although that's definitely not the point of the series, more of a byproduct. Verdict: An absolute must-buy. These graphic blends are perfect for kids who desperately want to read comics and parents who desperately don't. Hand this one to fans of fractured fairy tales, previous fans of Dragonbreath, kids who like funny stories and adventure. I saw the cover of this board book at ALA and it really grabbed my eye, but the book itself was disappointing. The idea of bright colors and geometric shapes was good, but the execution of the design is too complicated for a board book for small children. It gets very crowded and some of the more abstract shapes are hard to identify as the various plants and other garden things. The book is a thick square, 9x9 inches, and has a lot of thick pages - it weighs almost a pound! I am a little doubtful about the binding of such a thick book holding up as well. It's from a small publisher and is more spendy than the average board book - about $10. Verdict: I would have been more likely to purchase this as a concept book for preschool age kids, and when I did a little searching it looks like it is actually available as a hardcover, but as a board book it misses the mark. Toddlers and babies might enjoy the bright colors and geometrical shapes, but they are likely to have trouble identifying the objects and the weight of the board book is an issue, while the cost is more than most libraries will spend on a board book. I had reservations about this book when I read the description; I always think books that encourage reading vs. screens are sort of...well....silly. 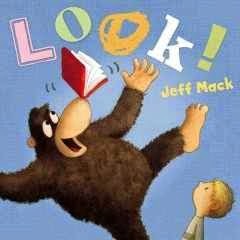 I mean, if you're not reading, you're not going to get the message and if you're reading it you're already reading so...but Jeff Mack is so funny and my library has loved everything he's done, so I gave it a chance and he came through for me! With only two words, "look" and "out" you wouldn't expect much of a story but drama, friendship, action, hilarity and silliness ensue when a friendly gorilla tries to get a little boy to LOOK when the little boy just wants the gorilla OUT. The gorilla isn't sure what these strange square things are, but they seem perfect for getting the little boy's attention. But the boy is glued to his screen. The gorilla's antics escalate until tragedy strikes and the boy sends the gorilla OUT! and looks sadly at his broken tv...but there is a book right there and it's open and...a friendship develops and together they LOOK. The two characters are delightfully expressive throughout their interactions, but there's so much more to the art than just the characters. Each page has a different "bookish" background, from the classic library date stamp in the front of the book to faux leather bindings, crumpled pages, and those classic library bindings. The text changes fonts on every page, from collage letters to scribbled crayon, matching the mood of the scenes. Verdict: This is a perfect book for storytime, but also for beginning readers to practice their visual as well as textual literacy. This is definitely going on the list I'm making of picture books for beginning readers. Highly recommended. I'm a big fan of nonfiction picture books that can be easily adapted to read aloud and that tackle unique animals or subjects, especially if they're gross. Kids love this stuff, even if it makes teachers and parents groan! This one hits all my requirements and although at first glance it might seem a little bit of a knock-off of Diary of a Fly, it's really its own unique book. The titular fly zips into a classroom and is discouraged to find that all the kids are studying, yet again, butterflies. But flies are pretty cool too and he is going to tell his audience exactly why. Like butterflies, flies metamorphose. They have cool body parts that butterflies don't have, like halteres and a unique flight pattern and setae. Ok, yes, it is true that they throw up on their food, but only some of it! And yes, they do carry diseases, but they're not mosquitoes! In a humorous about face, Fly convinces the kids to study him instead of a butterfly...only to find out that this "being studied" thing isn't quite what he expected! Fly finishes up with talking about how flies fit into life all over the world and are used in scientific study. Back matter includes a child-friendly glossary, bibliography that includes multiple websites, and acknowledgement of three experts. 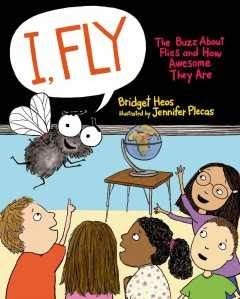 The illustrations are cheerful cartoons, mainly focusing on the fly and children in different settings, but they also do a good job of clearly setting out the fly's habitat and habits. The text is a little long to work as a straight read-aloud, but it would be fine if you pick and choose sections as you go through the book. Verdict: This was a very funny and informative look at a fly, a creature that usually doesn't get much attention. It will get plenty of laughs and "that's so gross!" exclamations from your audience, while informing them about flies. Recommended. Phew. Programs are over. Now it's time for outreach, planning, and vast amounts of organization. Remembered that there was a program in the storyroom on Saturday and EVERYTHING would have to be cleaned out. Found out I would have no shelvers until Tuesday. Found a new book on the shelf with ICKY MOLD. Volunteer I was depending on to help me in the last-minute panic haul to the basement didn't show. Recyclables and stuff organization in basement pretty much finished! The preschooler who wanted books about farting is back - this time he's interested in weather, especially clouds and tornadoes and they also needed books on bullying. Some movie reader's advisory - the child was with the grandparents, but I know him and his parents and I helped him find something that wouldn't be too scary. of paper towel tubes and decorative paper stars under the table. on a kid. And my stash of water bottles. I drink a lot of water. I don't think I ever posted these, although Jess made them months ago! I saw a library that repurposed an extra tv screen into interesting facts and then directed you to the Dewey section. I asked Jess if she could make a couple for the end caps of the nonfiction. I don't know that I've seen people read them, but I don't look back there a lot and I think they're pretty cool. I'm not personally a fan of historical fiction, or spunky girl characters, so I would have been very skeptical of this if I hadn't enjoyed Hannigan's previous title, Cupcake Cousins so much. Nell Warne shows up at her aunt's boarding house in Chicago with plenty of misery and worries. She's an orphan with no other relatives but her Aunt Kate and her aunt seems none too interested in admitting any responsibility for her. Nell's best friend Jemma is far away in Canada and it looks like Nell is going to end up in an orphanage whether she likes it or not. 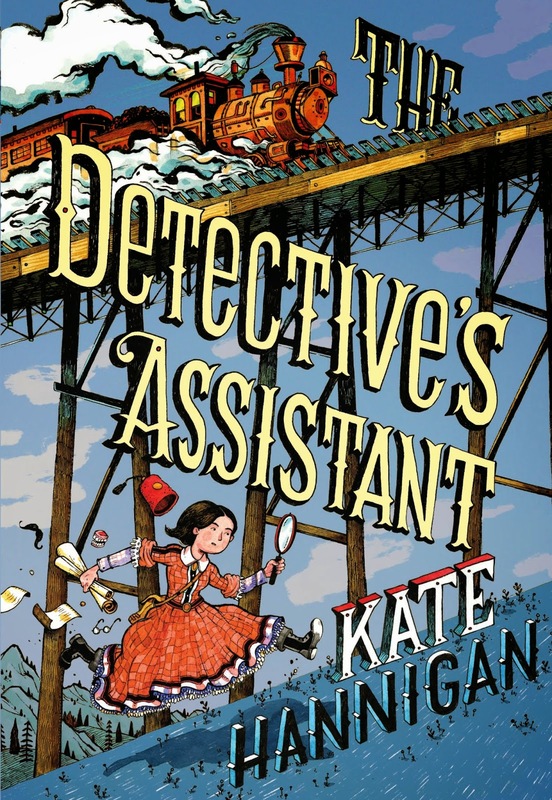 But Aunt Kate, while she may be a Pickled Onion, has an exciting secret; she's the first female detective for Mr. Pinkerton's detective agency. Nell is determined to stick to her newfound family and be part of Kate's life, including her cases. But there are frightening events on the move, more than just a few cases of stolen money or murder, and both Nell and Kate will have to adjust and grow to be able to face the coming challenges. This maintains a light-hearted feel, even though it deals with serious events like the looming Civil War, slavery, the Underground Railroad, and the challenges faced by a single woman on her own. Nell's story is interspersed with letters to and from her best friend Jemma, which add to the plot until all the pieces come together at the end, revealing not only Nell's family secrets but Jemma's as well. I really enjoyed the small details that Hannigan included about everyday life for women; the financial struggles, clothing, sights (and smells) of Chicago. An author's note includes more information about the real-life Kate Warne and there are also more resources for readers who want to explore the history further. Verdict: This historical fiction will appeal to readers who like history as well as those who enjoy exciting adventures. There are also several mysteries interwoven into the story from the individual cases to the mystery of Nell's family and I can booktalk mysteries to about 80% of my readers. A great blend of different genres that will introduce kids to several important historical events in a fun and interesting way. Highly recommended. 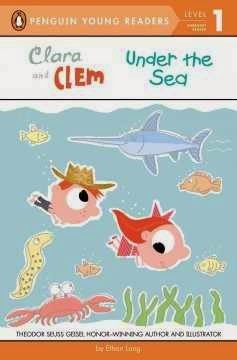 Clara and Clem have starred in several easy readers from Penguin. This Cybils finalist is fun, easy, and attractive to emergent readers. Clara and Clem, two bulbous-headed pink siblings (who look rather like pink goldfish) are setting up blocks when their play morphs into a real ocean! They dive in and experience the wonders of the ocean, from dolphins to rays, in simple one or two-word rhymes. The words are presented in speech bubbles, green for Clara and red for Clem. "Gold! Bubble. I see trouble." Eventually they return to the real world, but they won't stay there for long as Clem demands "Again!" Long's illustrations, outlined with white borders, are drawn in cheerful pastels, with Clara and Clem and their speech bubbles standing out strongly from the soft backgrounds. Little details, Clem's hat, Clara's clothes, are collaged photos. There are a few two-syllable words, but most are simple and there are only a couple three or four word sentences. The font is large and readable and the simple, cheerful illustrations add a light touch of humor but keep the focus on the words. Verdict: It's not surprising this was a Cybils finalist. It's simple but funny and perfectly captures the right level of imagination, humor, and interest for a beginning reader. Highly recommended for your easy reader section. The cover picture here does not do justice to Christy's glowing, soft colors, so you'll just have to trust me - they're gorgeous. Rhyming couplets in a small, white type are set unobtrusively at the corners of the page. The language is pleasant, but not memorable. Every few pages the refrain of the title is repeated, followed by several pages of couplets. "When the wind blows...Trees dance./Spiders curl./Mice shiver./Leaves swirl." The real draw of this book, and what made me fall in love with what wouldn't normally be my cup of tea, is Jana Christy's art. It not only glows, it perfectly captures the swirl and dash of the wind. The art was created with pencil sketches and mixed media, then assembled and painted digitally. It gives the illusion of watercolors, but with richer colors and intriguing lines and textures in the background. 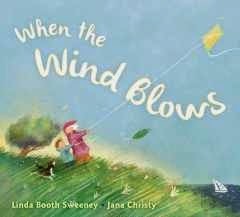 The pictures follow a family; grandmother clad in bright pink, little boy in a green jacket, mom and the baby in a stroller, as they excitedly venture forth on a windy day. First they fly a kite in a windy field, with the grass swirling with colors. Then it's down to the seaside, where the boats are bobbing along. They walk along the beach and up into town. It's begun to rain and there are puddles to splash in. They visit the park, hats and leaves flying through the air around them. The storm is building and they hurry home, wet and tired but happy, to watch the rain through the window. A warm bath and it's time for one last cuddle before bed. Verdict: Perfect for toddlers at a rain-themed storytime, or looking at with older kids and talking about what's happening in the weather in each picture. Or just cuddle up and read before bed on a windy, rainy day. Recommended. I'm still working on updating my activities/crafts nonfiction section and we always need new drawing books, so I decided to check out this title, which is a little different than the usual drawing books I purchase. The book starts with a discussion of drawing tools. Although it says you can just use a pencil and paper, it goes into a lot of detail about special pencils, erasers, blending tools, paper, and other items as well as a drawing space. The next sections focus on basic drawing skills, shading, features like eyes, noses, etc. and drawing different types of fur. The actual drawing instructions all start with a lightly penciled outline and then demonstrate how to add details and shading to create the finished art. The pictures start out simple, with just animal faces, and get more complicated with different poses. 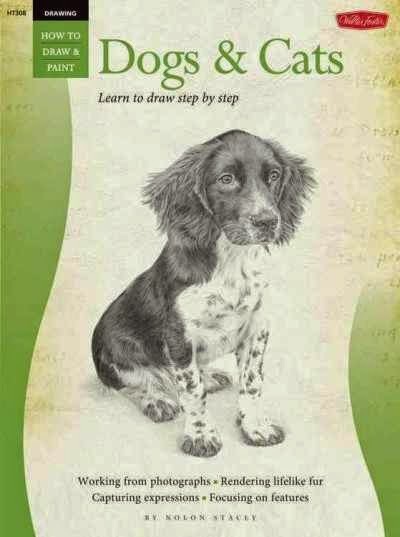 I was doubtful about this one at first, as it's much more advanced than any of the other drawing books I have for kids, and I can't exactly test whether it works or not because I have absolutely no artistic ability (as witness my aide's hysterical laughter when I sketched out a bulletin board design for her to create). However, I do have older kids that I think would enjoy trying out more complicated techniques and, more likely, I often get adults looking in the children's section for easy drawing books. This is available in paperback, so I think I'll take a chance on it. Verdict: If you're looking to add drawing books for an older audience, I think this is a good selection, but I'm not an expert in this field. The first photo, as I try to grasp what is happening. There are unseen masses of stuff to the left and right. Then I decided to clean from the back outwards. What a week. Meetings all afternoon Monday, then a scheduling snafu that ended up canceling Tiny Tots Monday night, then on Tuesday I dealt with building code and fire inspections and the aftermath; I've now got half the contents of my storage closet piled behind my desk because whoever designed the building didn't think to give us any storage space sans electrical panels. I'm going to be spending the next couple weeks juggling summer preparations, cleaning out the basement, and hauling stuff down to the basement. And a mess up with the donor letters, although hopefully I think that will be easily fixed. Then another schedule complication. OY. I spent a lot of Wednesday dealing with a string of stuff - I moved stuff around in the workroom (putting things on top of things) so we can at least see what needs to be reorganized, then I was able to get to some of the stuff on my desk. A few people came to storytime and I spent a while venting to my associate. We're trying middle school madness as a passive program because there really has been no turnout. It's just that kind of week. I started work on the basement Thursday morning, wishing I'd brought shorts or something as the weather has randomly turned hot and muggy and the basement is not air-conditioned of course. My coworkers are TAUNTING ME WITH SINKS. Friday morning - I moved a lot of stuff around in my office, thus my rather sweaty and disheveled appearance in the videos filmed this morning...finished a bunch of little projects, then left at 12:30 for a 2 hour trip to Walmart. Hopefully the last! Saturday - I went in around 9:30 to finish setting up. I also took all the crap from yesterday's 2 hour shopping trip out of my car. It took forever and I was miserably sweaty and now there is more stuff even than you see in the pictures. Despite all the little things indicative of this week - there was a baby shower in the community room, I had to move things around, the dancers had things go wrong and were late, in the end everything went fine and about 60 people came! The local ballet studio came and did some dances in the lobby, including stuff from their upcoming Cinderella show, then the kids could take pictures with Cinderella and Prince Charming and Cinderella read them her story. The best part was when one of my two special needs boys was so inspired by a dancer he got up and started leaping and twirling along with her! Also, I had craft materials to make cards and muffins and doughnuts out in the Storyroom all Saturday. I didn't stay though - I left around noon. of the hitherto unused file cabinet. Lots of mess still left. A lot of requests for the Pigeon books. Read-alikes for Who's Hiding? by Satoru Onishi. I've worked with this patron before and horned in on her discussion with my associate to bring out the newest Britta Teckentrup - Where the Pair? and there was a Masayuki Sebe she hadn't seen yet. However, there is still lots of work to do. Donations are wonderful, but NOW?